Since angular cheilitis is a mouth-based illness, its not surprising that many people switch toothpaste to see if it helps, but will this help treat the angular cheilitis? 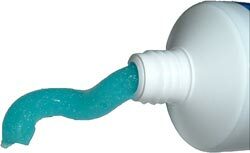 A majority of toothpastes on the market today contain an ingredient called Sodium Lauryl Sulfate to help the toothpaste foam up (allowing it to spread throughout the mouth easier). Some people claim that it is the sodium lauryl sulfate that causes the angular cheilitis, however this is not the case. Switching your toothpaste will not prevent nor heal your angular cheilitis, but it is possible that toothpaste's foaming can make your angular cheilitis more sensitive while brushing your teeth. So switching your toothpaste may make it easier to brush your teeth more thoroughly when you are suffering from angular cheilitis. Angular Cheilitis Treatment Guide Get the complete guide on how to cure angular cheilitis in 24-hours or less. Angular Cheilitis Abreva Can Abreva (the cold sore medication) also help to cure angular cheilitis? Find out. View more angular cheilitis treatments.